My 2nd activation on Sunday 29th September, 2013, was the Mylor Conservation Park, which was just a short 10 minute drive from Scott Creek. 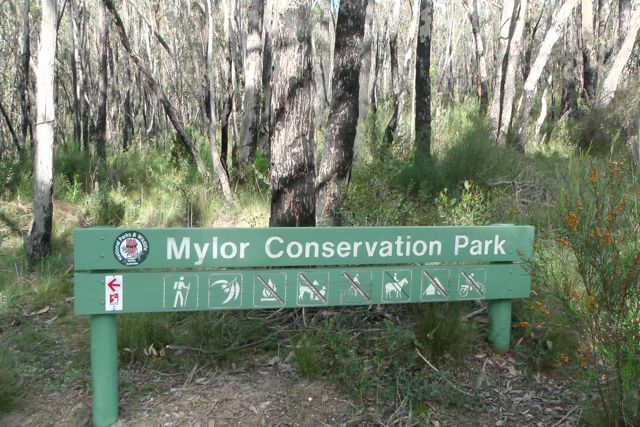 Mylor Conservation Park is situated in the Southern Mount Lofty Ranges ‘Adelaide Hills’, about 15 km south east of Adelaide. 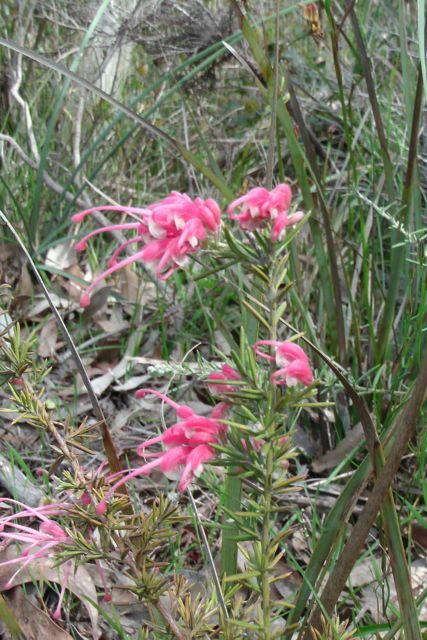 The park consists of 49 hectares of remnant bushland. 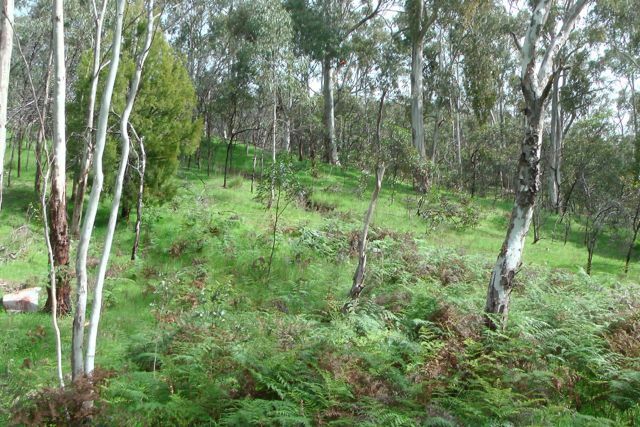 Much of the region surrounding Mylor Conservation Park has been largely cleared for residential and agricultural purposes. The park forms part of a mosaic of remnant bushland areas in the district which are linked by vegetation corridors on both public and private land. 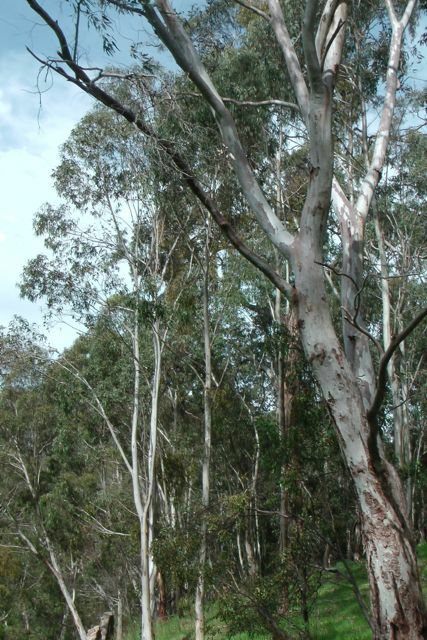 The park is covered by open forest with a canopy dominated by Messmate Stringybark and Brown Stringybark, associated with a shrubby under storey. 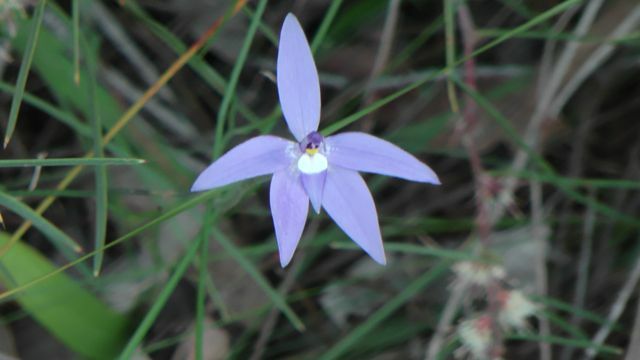 The park has abundant wildflowers in spring and many of the native plants were also out in flower. The Onkaparinga River flows just to the east of the park boundary. The park is used for a number of outdoor recreational activities, such as bushwalking or horse riding through the open woodland. A section of the Heysen Trail runs through the park. Numerous bird species inhabit the area, including the endangered Yellow tailed Black Cockatoo, Purple-crowned Lorikeet, Superb Fairy-wren, and Red-browned finch. A large number of native animals call the park home including Western Grey kangaroos, echidnas, and the deadly Eastern brown snake. Because it was such a warm day, I was ever vigilant of snakes. Fortunately none were encountered ! I accessed the park via Whitehead Road, just off Strathalbyn Road (the main street of the quaint little town of Mylor). The town was proclaimed in 1891 by Acting Governor of South Australia, Sir James Boucaut, who named it after his Cornish birthplace. Towards the end of the Whitehead Road there is a small parking area. From here I walked into the park and set up my gear, using the north western park boundary fence to secure my squid pole with some octopus straps. The chickenwire fence also made a nice back rest. Fortunately the track heading north at this point made a good clearing for me to string out the legs of the dipole so the antenna was radiating east-west. I found a comfy spot up against the fence, in the shade from the hot sun (it was about 28 deg C). After turning the radio on I was pleasantly surprised to hear that the noise floor was nice and low. A lot better than Scott Creek Conservation Park. However there was a lot of RTTY QRM due to the RTTY contest. Again I tuned to 7.100 and again there was Brian VK5FMID, patiently waiting for me. 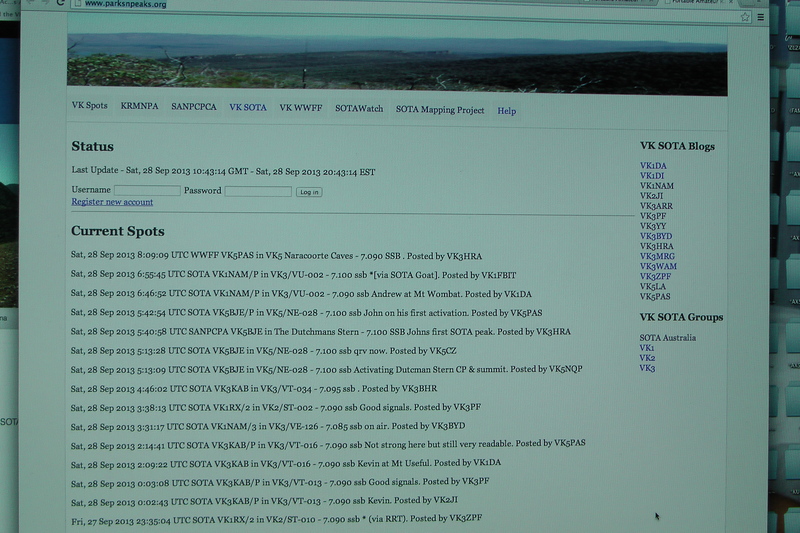 This was followed by Peter VK3PF, Dale VK5FSCK, and John VK5FTCT. And to my pleasure, what followed was a steady flow of callers from VK2, VK3, & VK5. All with great signals. I worked a few QRP stations including Andy VK5LA on 5 watts, Ben VK3FTRV on 5 watts, Shaun VK3VLY on 5 watts, Simon VK5TE on 5 watts, and Andrew VK2UH also using 5 watts. 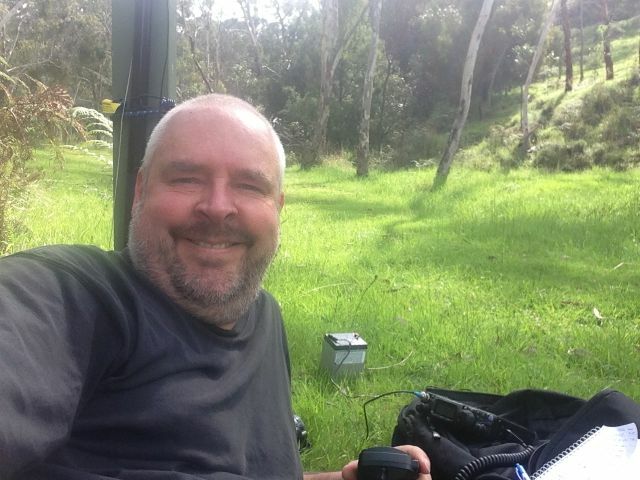 When things slowed down a little, I tuned down to 7.095 and worked Ian VK1DI/2 who was on top of Mt Gillamatong, VK2/ ST-034 in the Southern Tabelands of NSW (5/5 both ways). I then tuned around the bands and on 7.105 I heard Steve VK2FISN just finishing up a QSO with another VK2. Steve had tried calling me numerous times on 7.100 but unfortunately he just couldn’t quite hear me well enough. I called Steve and we were finally able to make a contact. Perseverance counts ! In a little over an hour, I had 31 stations on 40m SSB in the log. Time to head home & ‘beer o’clock’ ! Brian VK5FMID; Peter VK3PF; Dale VK5FSCK; John VK5FTCT; Allen VK3HRA; Colin VK3UBY; Mal VK3AZZ; Greg VK3HBM; Sandra VK3LSC; ANdy VK5LA/qrp; Tim VK5AV; Nick VK3ANL; Ron VK3AFW; Peter VK2NEO; Ian VK5CZ; Ben VK3FTRV; Bernard VK3AMB; Fred VK3JM; Shaun VK3VLY/qrp; Graham VK5KGP; Shaun VK5FAKV; Rick VK5FGFK; Colin VK5HT; Simon VK5TE; Roy VK5NRG; David VK5KC; Ian VK1DI/2 (SOTA); Steve VK2FISN; Jim VK3AIX; Nev VK5WG; and Andrew VK2UH/qrp. Thanks everyone. A fun afternoon in the sun. Sunday morning, 29th September, 2013, started off as quite a gloomy morning, but by lunchtime, after a morning of gardening, the weather had warmed up and it had turned into a beautiful day. So after some sweet talking the wife, I decided to head out and activate a couple of parks. My first activation was the Scott Creek Conservation Park. 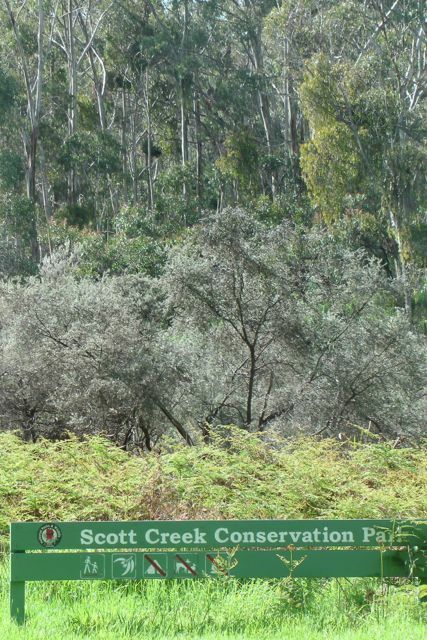 Scott Creek CP is situated about 30 km south of Adelaide, in the Mount Lofty Ranges ‘Adelaide Hills’. It is about a 30km drive from my house in the Adelaide Hills or only 15 km as the crow flies. 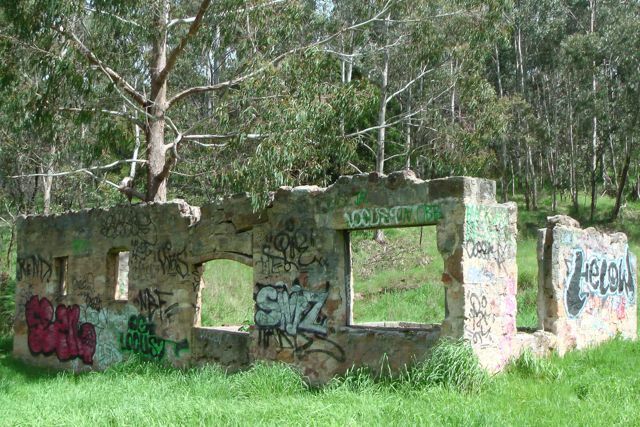 The Park consists of an area of 750 hectares with much of the terrain being hilly and rugged, with steep slopes falling into a number of small creeks, eventually leading into Scott Creek, which flows out of the park and into the Onkaparinga River. At its highest, which is on its eastern side, the park has an altitude of a little over 400 metres. This drops down to the lowest spot, near where Scott Creek crosses under Dorset Vale Road, which is about 230 metres above sea level. 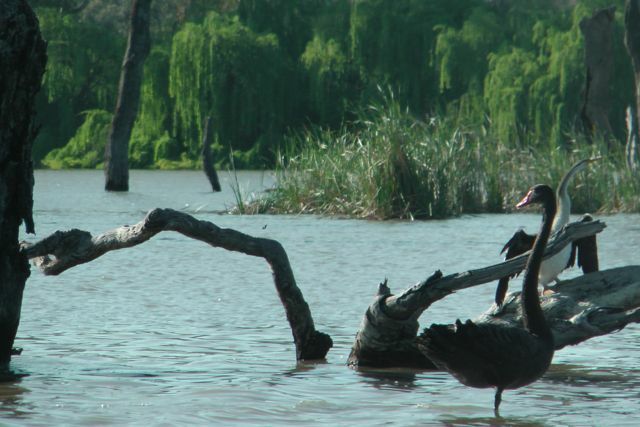 The land was privately owned until the early 1970s when land was purchased by the South Australian Government, with the park being officially declared in 1985. 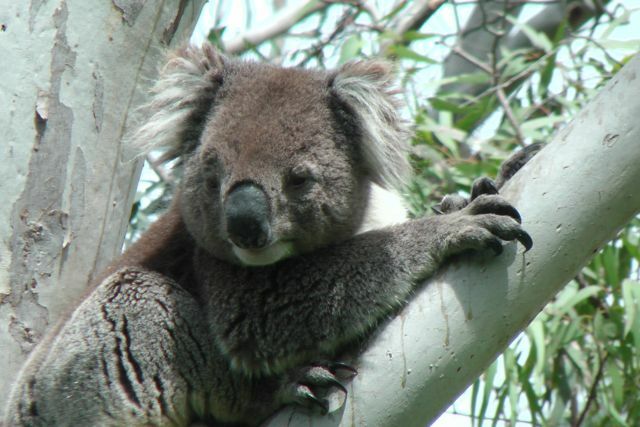 The Park is home to many threatened species of the Mount Lofty Ranges. A large variety of native marsupials inhabit the park including the Southern Brown Bandicoot, Western Grey kangaroo, Koala, Yellow footed Antechinus, Common Ringtail Possum, Common Brush tailed possum, and Short-beaked echidna. Over 132 species of bird have been recorded in the park, including Wedge Tailed eagles, Rainbow Lorikeets, Crimson Rosellas, Rainbow Bee Eaters, Superb Fairywrens, and the endangered Beautiful Firetail and Chestnut-rumped Heathwren. There are 6 known species of amphibian in the park including the Brown Tree frog and Eastern Banjo frog. Six species of bat have also been recorded in the park. 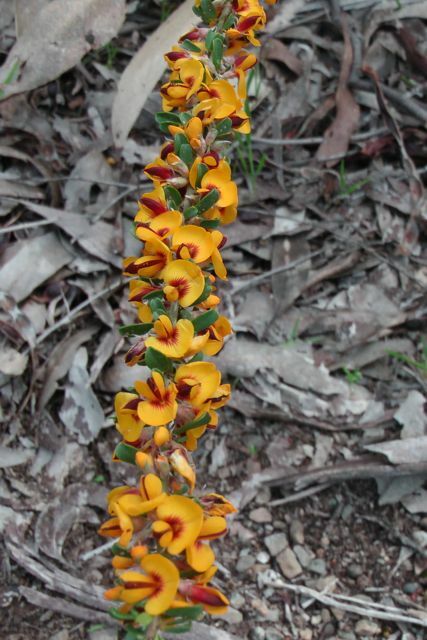 The Park has a large variety of native plants and contains more than 60 species of orchids. 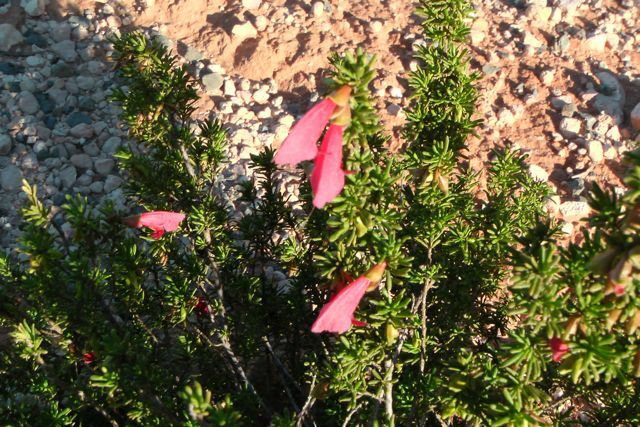 In fact over 465 different indigenous plants have been recorded in the park. A large number of the natives were flowering during my visit. The Park was once part of a major travelling route for the Peramangk Aboriginal people, through the hills and down to the plains of Adelaide. 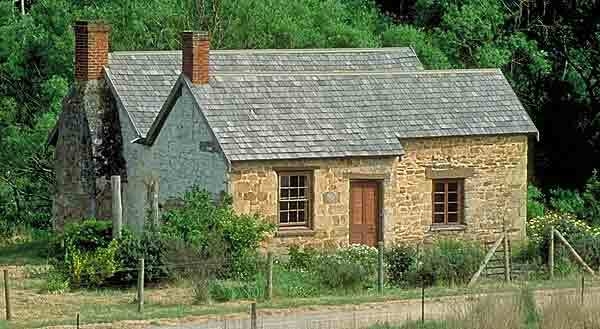 In c. 1847, a Mr. Scott brought his flock of sheep into the area, and he pitched a camp near the bottom of the creek, near the Onkaparinga. Settlers in nearby Cherry Gardens referred to that locality as Scott’s Bottom, and the little stream as Scotts Creek. It is claimed that in 1850, the wheels of a bullock dray broke off rock fragments which people recognised as copper. Subsequently, a mine, Wheal Maria, was established and attempts made to mine for copper. A 30 foot shaft was sunk but it was not immediately productive with quantities of ore being small, so it was abandoned within a few short years. 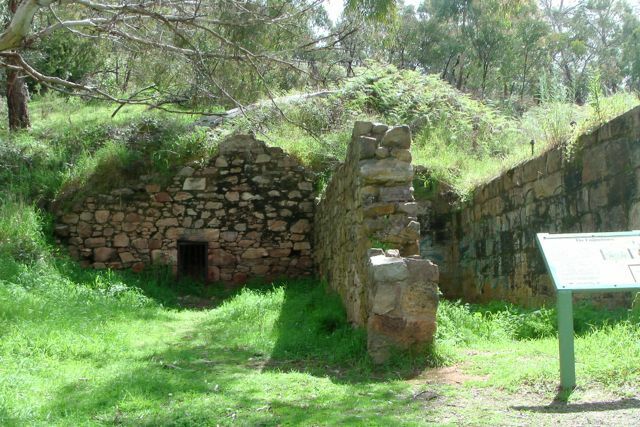 However, in 1866, some Kapunda shareholders established a company to develop the lode at Scott Creek, and sent ore to the Port Adelaide Smelting Works. By 1868, the Almanda Silver Mining Association was formed. At the Almanda Mine at Scott Creek a treatment plant was established, along with boiler houses, and underground flue and Ey’s Tunnel a 60 metre long tunnel named after William Ey. A ‘SIlver rush’ resulted in a number of mines including the Esmeralda, the Colorado, the Potosi, all of which were short lived. These three mines were just outside the present day Scott Creek CP boundary. However, the fourth mine, the Almanda, which was the most significant, was entirely within the current day Park boundaries. But by 1870 – 1871, mining activtities by the companies had ceased and the population in the Scott Creek area had rapidly declined. 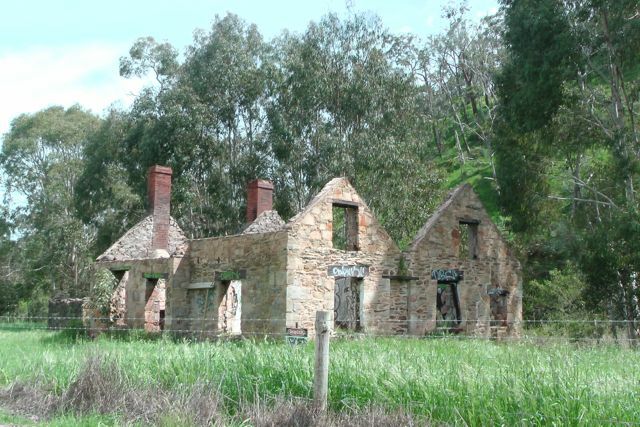 In 1876, a devastating bushfire ripped through the entire area, from Coromandel Valley all the way through to Echunga, and this destroyed anything that remained. As I drove towards the park, I stopped at Mackereth Cottage which is situated alongside Scott Creek. The cottage was built in 1839/1840 by George Mackereth, a farmer from Westmoreland in England, who settled in the area with his wife Sarah. The cottage was continually lived in from 1840 until 1976, when the National Trust took custody of the property from the Engineering & Water Supply (E & WS) and implemented much needed conservation works. For many years it housed a museum and on occasions provided Devonshire Teas on weekend openings to visitors, especially to local hikers and bushwalkers. In 1984, the National Trust relinquished its interests and the cottage was closed. It was reverted to the then E & WS Department now known as SA Water. Sadly it is in a state of disrepair and has been vandalised and is covered in graffiti. An indictment on our love of history ! Below is a photo of what the cottage did look like, and the terrible condition it is now in. I accessed the park via Scott Creek Road, and set up at the old Almanda Mine area. There are interesting ruins from the old silver mine here to explore with interpretive signs. It is quite interesting to stroll around. There is an old engine house, stone chimney, the mine office, a dairy and several mining shafts. Sadly, the old buildings have been vandalised with graffiti. This was not here when I last visited the park a number of years ago, and it is a real shame that people resort to this type of behaviour. There is a ‘Friends of Scott Creek’ group, but I am not sure how active they are. And maybe they have previously removed the graffiti, but the vandals keep coming back ? Either way, it is a real shame. The old mining area was the perfect spot to set up. It consisted of a large cleared grassy area with a large number of trees offering shade, and importantly a way to tie off the ends of the dipole. So I started to set up my equipment, under the watchful eye of a koala who was in one of the gum trees just above me. I secured the squid pole to a walking trail sign and turned on the FT-817nd, eagerly wanting to activate the park. But to my horror when switching on the radio there was a noise floor of S8 noise. It pays to look up…..not far away were power lines ! So I pulled down the antenna and walked about 100 metres further to the south and set up the gear again. This time the noise floor had dropped dramatically but was still there at S2-3. I was a bit hesitant as to how I was going to go with contacts. The noise floor was a bit high for my liking, and conditions earlier in the day at home into VK3 had been very poor. Prior to leaving I had heard a lot of the interstate SOTA activators, and their signals were way down compared to normal. So with some degree of uncertainty, I put a call out on 7.100 and was immediately greeted by the first keen ‘Hunter’, Brian VK5FMID, who is a staunch supporter of the Award. Ian VK5CZ followed with a very strong signal, Peter VK5PET, and Tim VK5AV. This was followed by a steady flow of callers which was really pleasing. In a little less than 60 minutes, I worked a total of 17 stations on 40m SSB in VK2, VK3, & VK5. It was time to pack up and head off to Mylor Conservation Park. Brian, VK5FMID; Ian VK5CZ; Peter VK5PET; Tim VK5AV; Colin VK3UBY; Andy VK5AKH; Sandra VK3LSC; Fred VK3JM; John VK5FTCT; Roy VK5NRG; Bill VK3HGW; Nick VK3ANL; Ivan VK5QV; Shaun VK5FAKV; Peter VK3PF; Peter VKNEO; & Dale VK5FSCK. 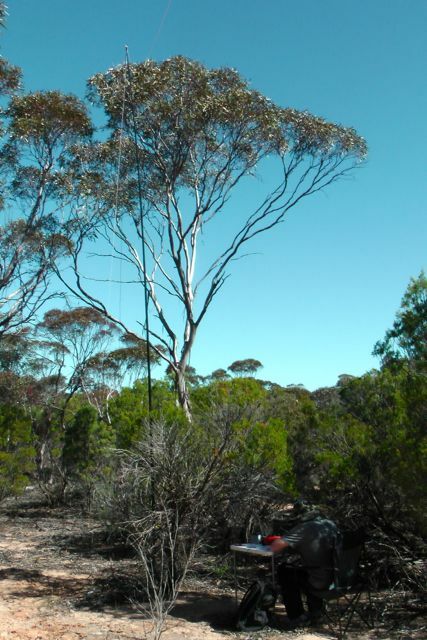 Allen VK3HRA has created a new spotting site which has the ability to spot SOTA & Parks activations. It supports SOTA, KRMNPA, SANPCPA, and also WWFF. It can be located at…..
Congratulations Allen on your efforts. A great idea. Sue, VK5AYL from AHARS is also liaising with Allen with regards to a possible phone app similar to SOTA Goat & Rucksack radio. After a very enjoyable 2 nights in Renmark it was time to head home. I had ‘strict instructions’ that I was allowed to operate from one park on the way home. So we headed south out through Berri, and on to Loxton. And then along the Karoona Highway to the little town of Alawoona. We continued south from Alawoona on the Alawoona-Lameroo Road, which disects the Billiatt Conservation Park. 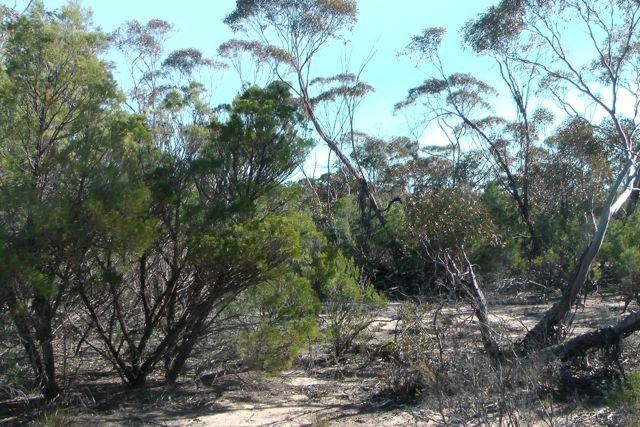 The park, which is about 18 km south of Alawoona, is 593 km 2 in size and consists of sand dunes and mallee scrub. 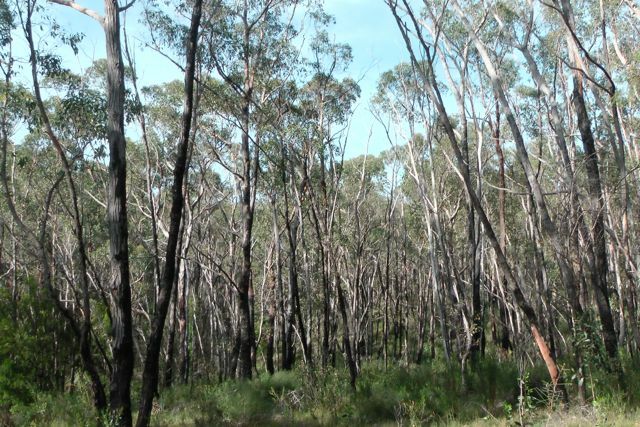 The ecological value of the area was first formally recognised in 1940, when the Billiatt and Peebinga flora and fauna reserves were dedicated. Following the acquisition of additional land in 1979, Billiatt Conservation Park was formally proclaimed under the National Parks and Wildlife Act, 1972. 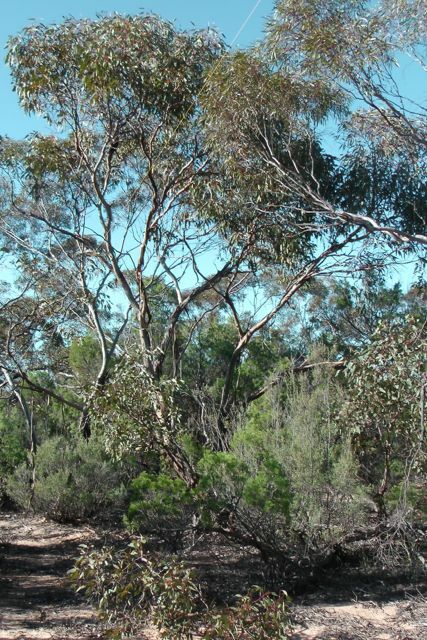 More recently, the majority of Billiatt Conservation Park was recommended for protection under the Wilderness Protection Act,1992, following formal assessment by the South Australian Wilderness Advisory Committee. The Billiatt Wilderness Protection Area was subsequently proclaimed in 2008, with a small area remaining as Billiatt Conservation Park. Although left largely uncleared, some attempts at farming the land within the reserves were made between the 1870s and 1930s. Some relics of earlier pastoral activity still exist, including old wells, bores and ruins. The Pankina Well and ruins in Billiatt Wilderness Protection Area are remnants of Pankina Station, a pastoral lease which existed over the land until 1979. A small area of vegetation was cleared as part of this development for sheep grazing, but is now naturally regenerating. A trigonometric point also exists in the southern section of the wilderness protection area. The Park is home to a total of 93 different native mammals including the Common Dunnart, Mitchell’s Hopping Mouse, Western Grey kangaroo, and the rare Western Pygmy possum. About 18 species of reptile are also found in the Park. The Park has been identified by BirdLife International as an Important Bird Area due to the fact that it contains small but globally important populations of Malleefowl, Mallee Emu-wren, and Purple-gaped Honeyeaters, as well as the rare Western Whipbird and Red-lored Whistler. 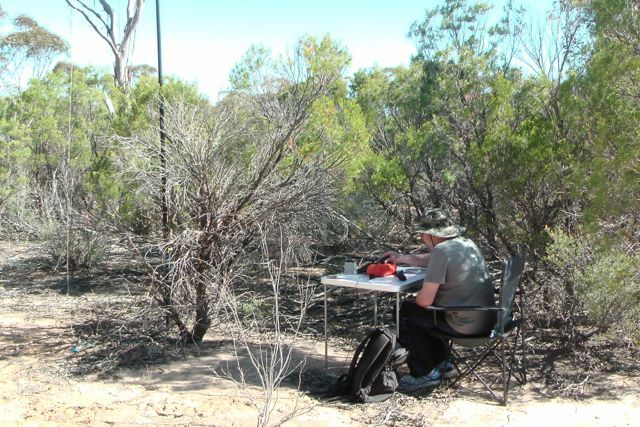 My wife Marija and I set up in a little clearing on the western side of the bitumen road, amongst the mallee scrub. I used the normal equipment…the Yaesu FT-817nd and the 40m/20m linked dipole. There was no shortage of trees and shrubs here to secure squid poles and the ends of the dipole. It was a warm day, so I set up the fold up table and deck chair as close as I could to some shade. My first contact was with Larry VK5LY, and this was followed by Marshall VK3MRG who was operating portable from Yarra Park in Melbourne. Marshall had a terrific 5/8 signal with his qrp 2.5 watt signal. 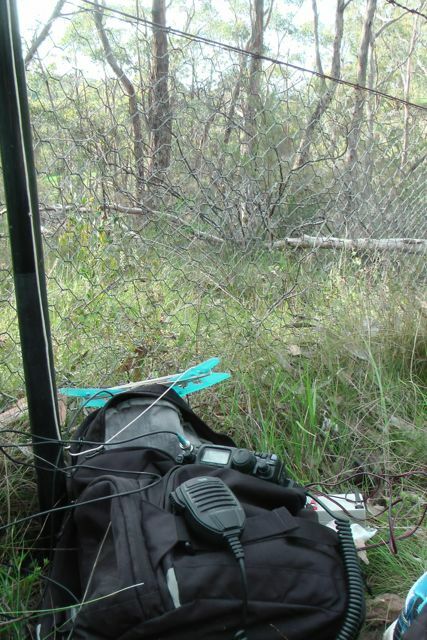 My 3rd contact was with David VK5KC who was portable in the Brookfield Conservation Park near Blanchetown. David and his wife Joy were also on their way home from the Riverland. 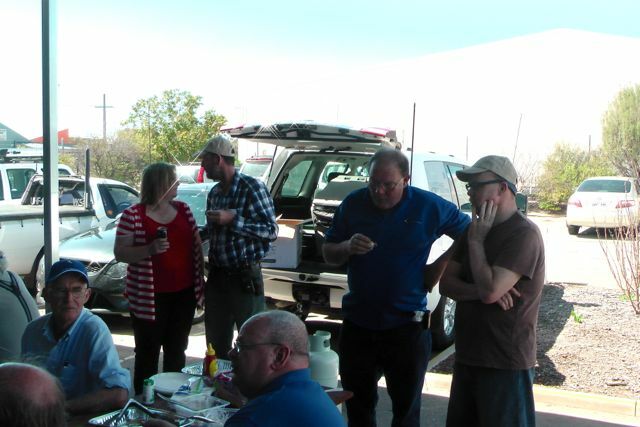 It was great to work David, and bag another ‘Park to Park’ QSO. Ivan, VK5HS was my fourth contact with a booming signal. I was then called by Andrew VK2ONZ who was operating from the top of Mount Lambie, VK2/ CT-007, in the Central Tablelands of New South Wales. Andrew’s signal was up and down dramatically. He sometimes peaked at 5/6 but then totally disappeared on me, despite the noise floor being virtually non existant. I also managed another SOTA contact, and that was with Kevin VK3KAB who was portable on Bill Head, VK3/ VN-004. Again it was good to hear from a number of stations operating QRP. They included Marshall VK3MRG/p, David VK5KC/p, Andrew VK2ONZ/p, Peter VK3PF, Ron VK3AFW, and Col VK5HCF. All had great signals and were very readable despite the fact that they were running with low power. I decided to have a quick listen on 20m and I was glad I did. There were some excellent signals coming in from Europe. I managed 3 DX contacts into Austria, Russia and Italy, with good signal reports given for my little 5 watt signal. The afternoon was getting on, and we still had a 2 hour drive to get home, so it was time to pack up. It was the end of a great weekend. I had a total of 22 QSO’s in the notebook from Billiatt CP, including 1 VK5 Park, 2 SOTA contacts, and 3 DX stations, so I was very happy. Larry VK5LY; Marshall VK3MRG/p; David VK5KC/p; Ivan VK5HS; Andrew VK2ONZ/p; Kas VK5ZKT; Tim VK5AV; Andy VK5LA; Graham VK5KGP; Nick VK3ANL; Kevin VK3KAB/p; Matt VK1MA; Roy VK5NRG; Peter VK3PF/qrp; Ron VK3AFW/qrp; Jim VK2TWY; Col VK5HCF/qrp; Rod VK5FTTC; Shaun VK5FAKV; Ivan OE3DIA; Oleg RY3D; Diego and IW2MZX. 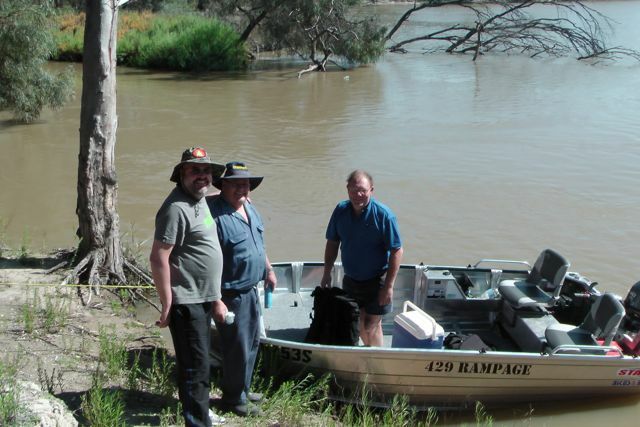 On Sunday morning, 22nd September, 2013, myself, my wife Marija, Larry VK5LY, & Ivan VK5HS, launched Ivan’s boat from Renmark and travelled upstream to Bulyong Island, part of the Murray River National Park. 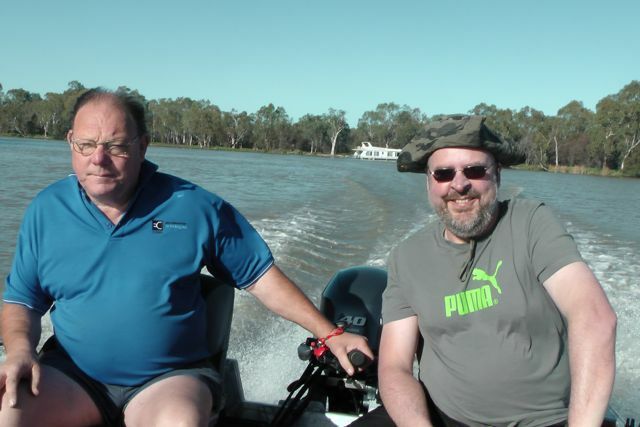 Larry and Ivan had told me they had always wanted to activate the island, so my visit to Renmark gave them an opportunity to do so. The Murray River National Park is located in the Riverland region of South Australia, about 240 km north east of Adelaide. The Park covers an area of about 13,000 hectares and consists of three separate sections of land – Katarapko, Lyrup Flats, and Bulyong Island. 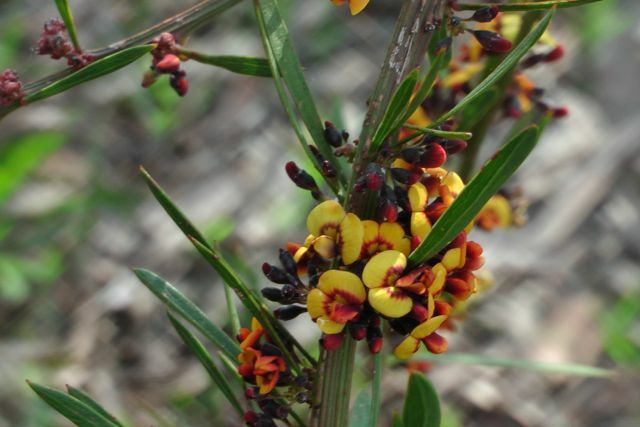 It was proclaimed in 1991 to conserve the unique Murray wetlands and their flora and fauna, which includes the threatened Regent Parrot, Golden Bell Frog, Murray Cod, and Murray Darling Carpet Python. The area was originally home to the Erwirung aboriginal people who were a relatively small Aboriginal group that lived on the fertile plains of the Murray. By 1851, the land surrounding Renmark was held under Pastoral Lease No. 95 by A.B. Cator. In July 1859, a portion of this lease was taken by William Finke and was subsequently divided into 2 properties named ‘Bookmark’ and ‘Chowilla’. During the 1860’s and 1870’s the leases transferred hands on a number of occasions. In 1887 the land was acquired from Bookmark Station by the Commissioner of Crown Lands for the establishment of the Renmark Irrigation Trust by the Chaffey Brothers. The Chaffey Brothers Irrigation Works Act, 1887, gave the legal right to develop 200,000 acres of land from Spring Cart Gully to the border for irrigation purposes. At the conclustion of World War One, Bulyong Island was leased by the Returned Serviceman’s League (RSL) as part of its returned soldier repatriation program. Primarily it was used for agisting horses while they were not being used for agricultural work. 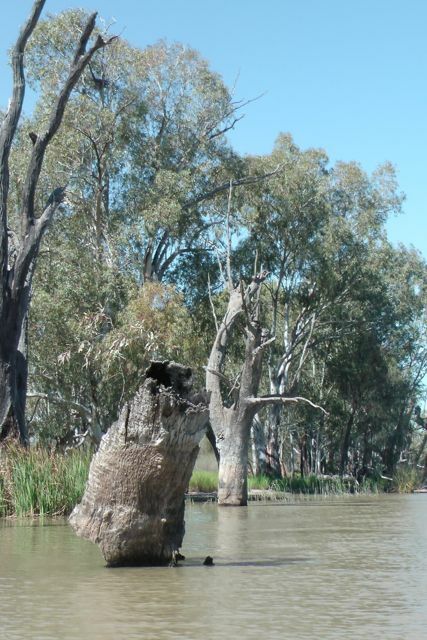 During the mid 1960’s the Renmark Irrigation Trust entered into negotiations with the RSL to obtain the northern portion of the Island for use as an evaporation basin. The RSL acceded to these moves and by the late 1960’s a series of embankments and an inlet/outlet structure had been established. 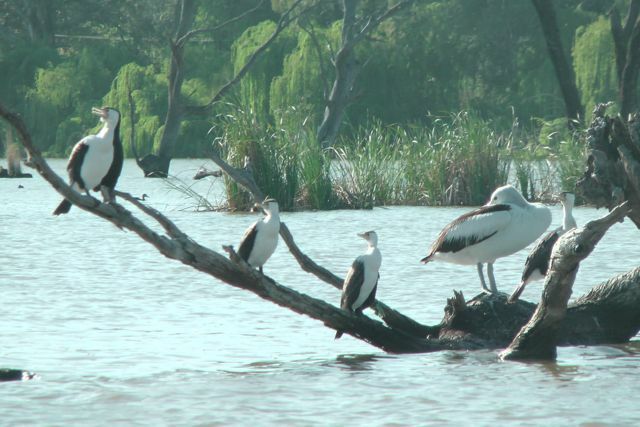 On the 20th June, 1991, the island was established as part of the Murray River National Park. The Murray River NP has an abundance of wildlife including kangaroos, echidnas, sand goannas, emus, and brushtail possums. Over 140 species of birds can be located within the Park. It is a valuable breeding and refuge area for numerous birds including the Australian Reed Warbler, Little Grassbird, Superb Fairy Wren, and the threatened Regent Parrot. During our trip up river we certainly saw a huge array of birdlife including Pelicans, rosellas, Black Swans, Cormorants, Herons, Dusky Moorhens, and Grebes. 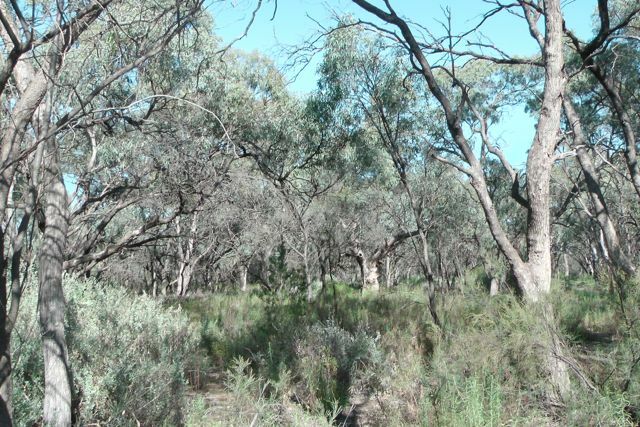 The park’s woodlands are dominated by mallee with an understorey of saltbush and bluebush, while the flood plain and swamp areas feature River Red Gums with a tangled under storey of Lignum. 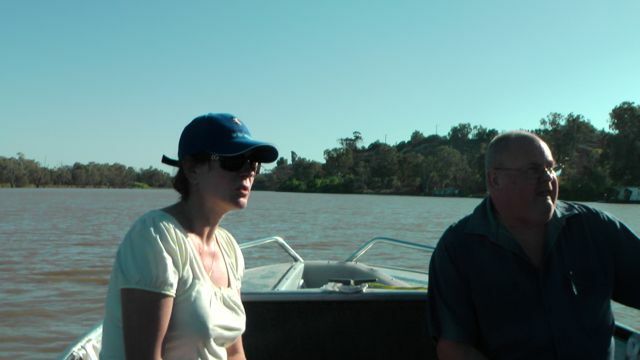 We boated upstream from Renmark to the mouth of the Bulyong Creek. 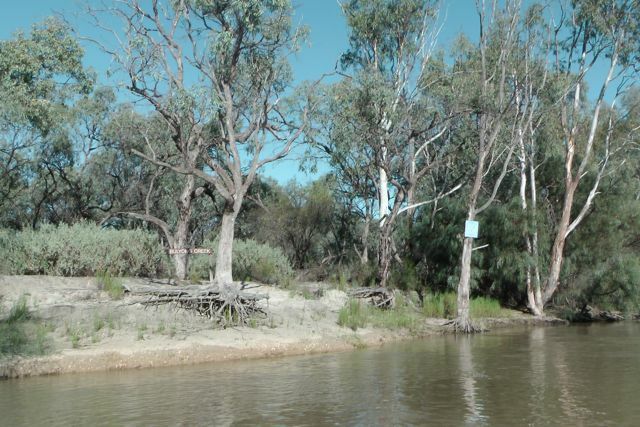 Access to this Section of the Murray River NP can only be reached via boat. The Bulyong Creek is a little tributory of the Murray River. It was a beautiful day, with not a cloud in the sky and an expected top temperature in the high 20’s, so short sleeves and even shorts were in order. 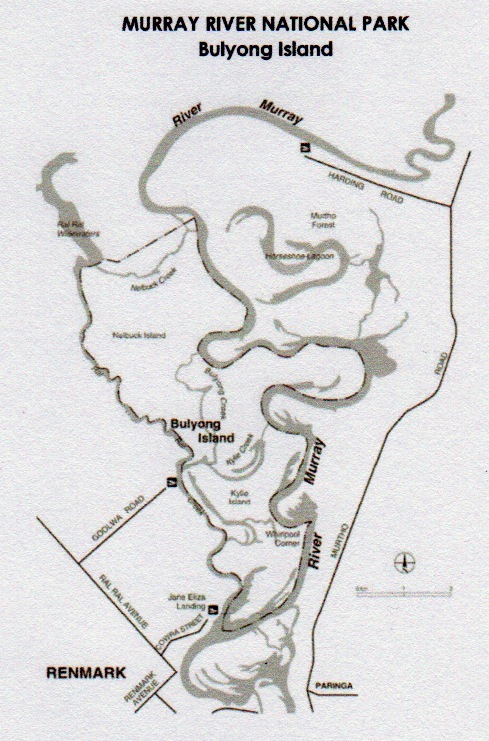 We moored at Bulyong Creek and stepped onto the island which is separated from the mainland by the Ral Ral Creek. Because it was such a sunny day, we kept an ever alert vigil for snakes. There are at least 12 species of snake located here including some dangerous snakes including the King Brown. So we made as much noise as possible, hoping that this might scare any unwanted visitors off into the scrub. We set up my 20m/40m linked dipole in an inverted vee configuration, supported by a 7m squid pole. 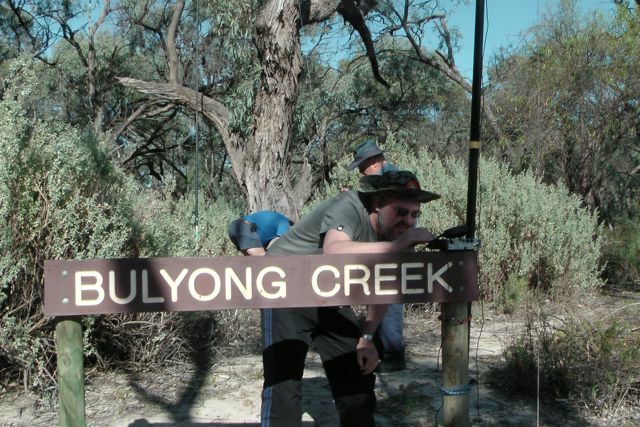 We secured the squid pole to a ‘Bulyong Creek’ sign using some octopus straps. 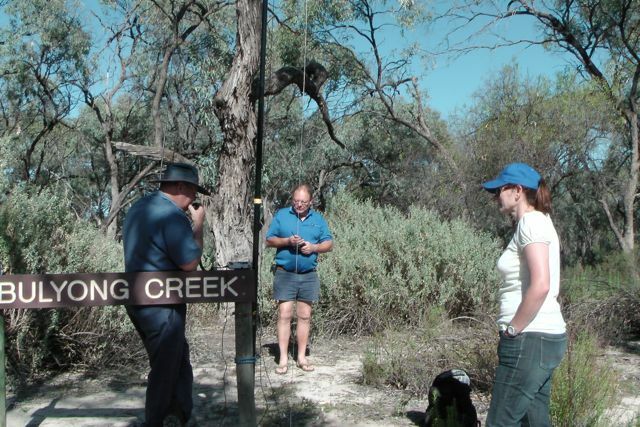 We rested the Yaesu FT-817nd on the Bulyong Creek sign. Ivan also set up his end fed and Codan HF transceiver. The first contact from the park was with John VK5BJE who had a very strong signal. This was followed by Andy VK5LA, Brian VK5FMID, and Nev VK5W, all of whom had good signals. But callers were few and far between so we often took a breather and enjoyed the views whilst listening to the WIA broadcast. Whilst on the island we had 2 Summits on the Air (SOTA) contacts. The first was with Andrew VK1NAM/p who was portable on South Black Range, VK2/ ST-006. 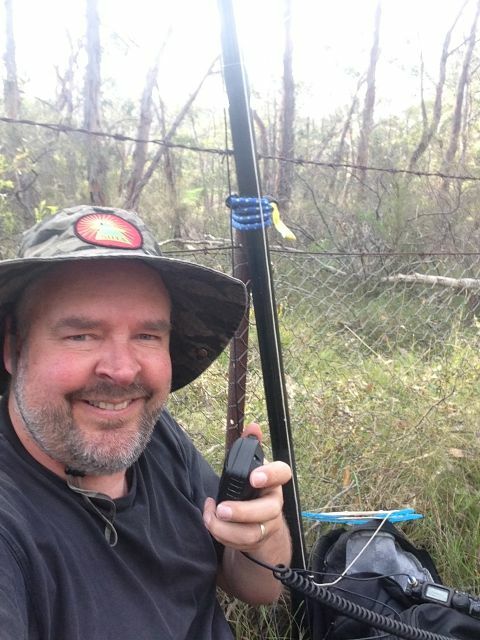 And our second SOTA contact was with Mitch VK3FMDV who was on Flinders Peak, VK3/ VC-030. Unfortunately we did not have as many callers as usual. This was despite the band conditions being good. Perhaps everyone was enjoying a Sunday morning sleep in. After the activation we headed down the Bulyong Creek, and then back out onto the Murray. The Bulyong Creek was something special, and the seclusion was only spoiled by the occasional passing boat. The bird life along the Creek was amazing. Eagles, hawks, a variety of water birds, rosellas, cockatoos, and parrots, were all out enjoying the morning sun. We also saw a couple of kangaroos taking a drink on the banks of the creek, who quickly jumped back into the scrub as we approached. We also spotted a goanna just starting to scramble up a nearby gum tree, so we moored the boat and I jumped off the boat to get a photo. 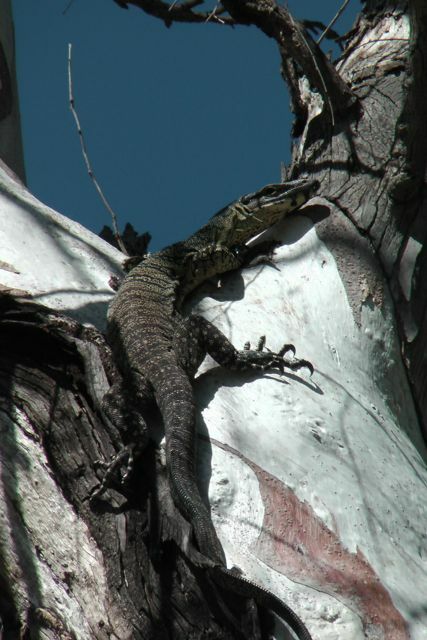 But the goanna was camera shy, so ever time I walked around to one side of the gum tree to take a photo, he/she decided they would crawl around to the other side. Much to the amusement of Marija, Ivan, & Larry ! We travelled further downstream along the Murray and travelled passed the Renmark foreshore, and onto Paringa and the lock, before turning back and heading back passed Renmark. Our only drama of the morning was Larry loosing his hat overboard, which was quickly retrieved. This was a great morning & a huge thanks goes out to Ivan VK5HS and Larry VK5LY. John VK5BJE; Andy VK5LA; Brian VK5FMID; Nev VK5WG; Colin VK3UBY; Andrew VK1NAM/p; Ian VK5CZ; Tony VK5ZAI; Sandra VK3LSD; Mitch, VK3FMDV; Allen Vk3HRA; Ron VK3AFW; Mike VK3XL; and Rik VK3KAN. On Saturday morning, 21st September, 2013, I gave a presentation to the Riverland Radio Club, on SOTA, the VK5 Parks Award, KRMNPA, & WWFF. 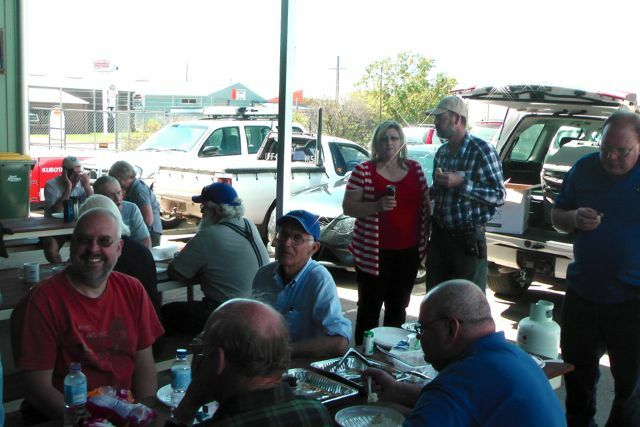 The talk was held at the SES Headquarters at Berri, and a total of 17 people attended. 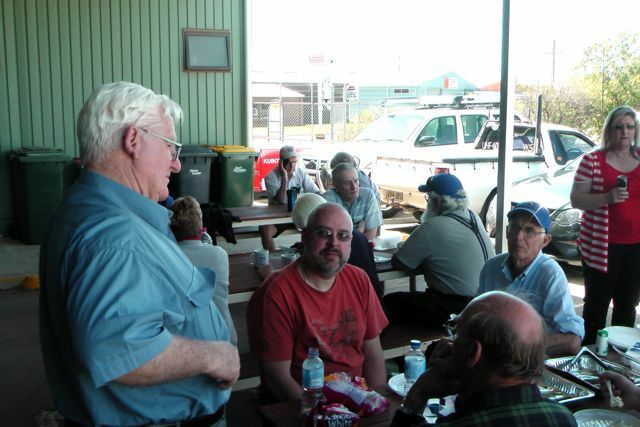 What was really pleasing was that some members of the Sunraysia Radio Group travelled across the border for the talk. It was great to catch up with lots of people I have spoken to on the radio, but never met in person. 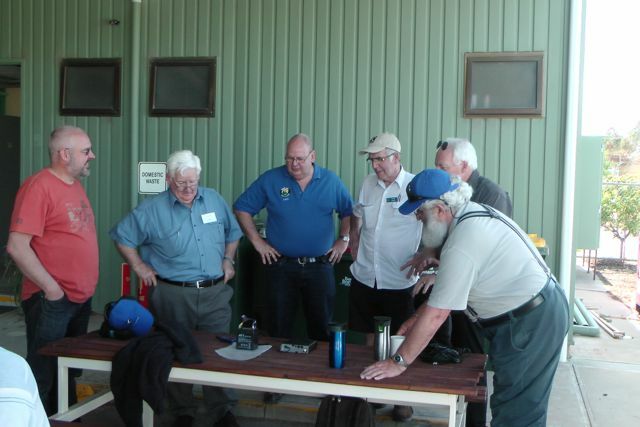 That included some active SOTA Chasers & Parks Hunters including Colin VK3UBY from Mildura, Andy VK5LA, Larry VK5LY, & Ivan VK5HS. David VK5KC & wife Joy also travelled up to the Riverland for the talk, and activated a park or 2 on the way home on the Sunday. Following the talk we had a BBQ and a good ‘chinwag’. It was a terrific morning & afternoon. A big thankyou to Larry VK5LY & Ivan VK5HS who organised everything. On the Friday night prior to the talk, a group of us went out for tea at the Renmark Hotel and had a very enjoyable meal. On The Saturday night a small group of us went out for tea at a local Italian restaurant, and again the food was great. Many thanks to Larry VK5LY and his wife Di, for their hospitality and allowing my wife Marija and I to stay at their house on Friday & Saturday night. They made us feel really welcome. The Riverland Radio Group has a website and it can be found at….. 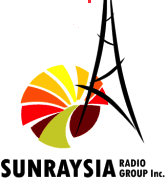 The Sunraysia Radio Group also has a website. 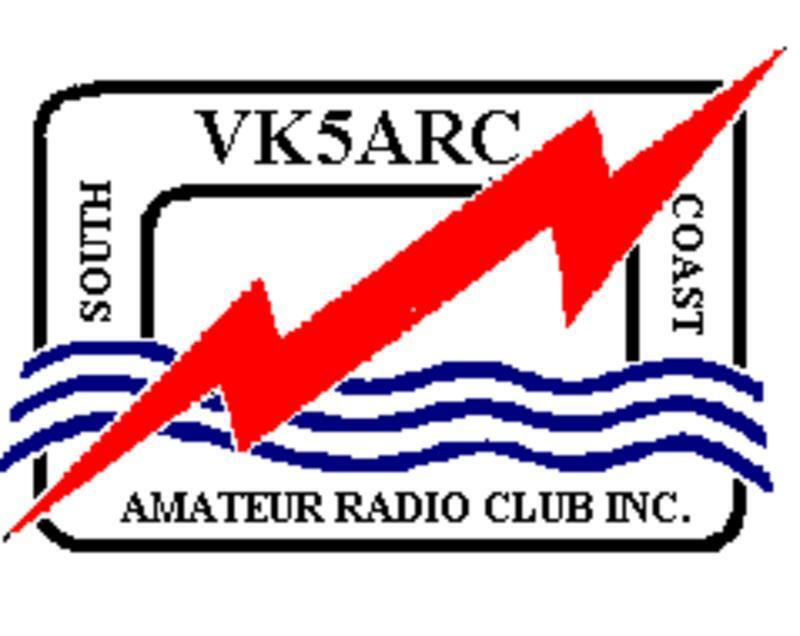 And it can be found at…..
Last night, Thursday 19th September 2013, I attended the South Coast Amateur Radio Club at Seaford Meadows, and delivered a presentation on SOTA, the VK5 Parks Award, KRMNPA, & WWFF. It was attended by a small but very interested group who hopefully will become involved in either one, or maybe all of these portable activities. A bonus of the evening, was to bump into an old mate who I had not seen in over 10 years. I was not even aware that he was an amateur, not was he aware that I had obtained my licence either.